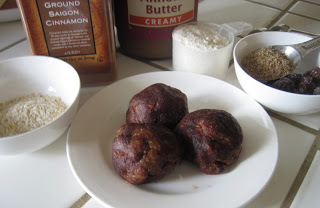 As you know, I love being creative in the kitchen, so as I tossed this and that together, I came up with this no-bake, make in minutes snack recipe: Oatmeal Raisin Vanilla Whey Protein Balls. I love to put several of these together the night before and place in snack bags for a ready to go instant power house pick me up. Place all the ingredients in a bowl and mix until crumbly, carefully add the water 1 tsp at a time. Use your hands to pick up the dough and form into 2-3 protein balls. Roll in additional cinnamon if desired.